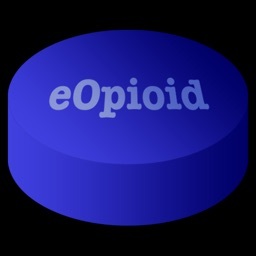 eOpioid™ is a sophisticated application with a suite of different functions that can perform complicated opioid pain medication dose calculations. 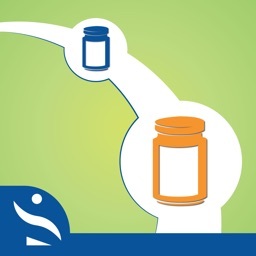 It can assist healthcare professionals determine proper doses of different opioid pain medicines for patients who may already be using opioids or are opioid tolerant. Other conventional opioid dose calculators may use the traditional method of simply converting the number of milligrams of one opioid to the number of milligrams of another opioid using a single conversion factor. eOpioid™, however, is able to produce more complicated calculations for opioids such as methadone or levorphanol, in which the equianalgesic dose is actually not a single value, but a relatively large range of possible values. 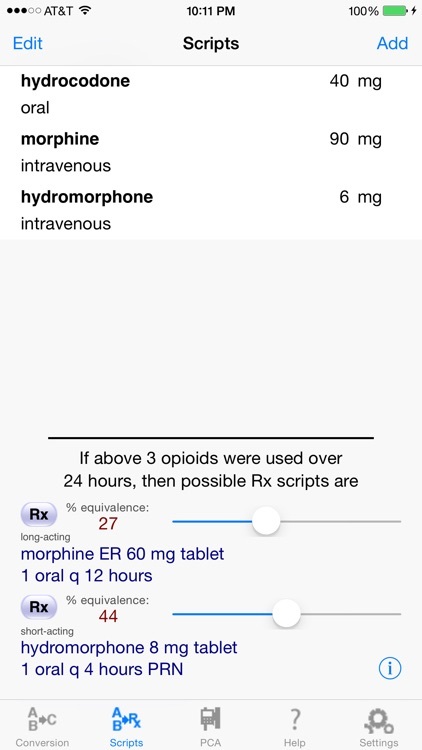 eOpioid™ not only calculates the number of milligrams for the new, replacement opioid of interest, but searches its database for the replacement opioid's available different sizes of tablets or patches and available dosing time intervals. 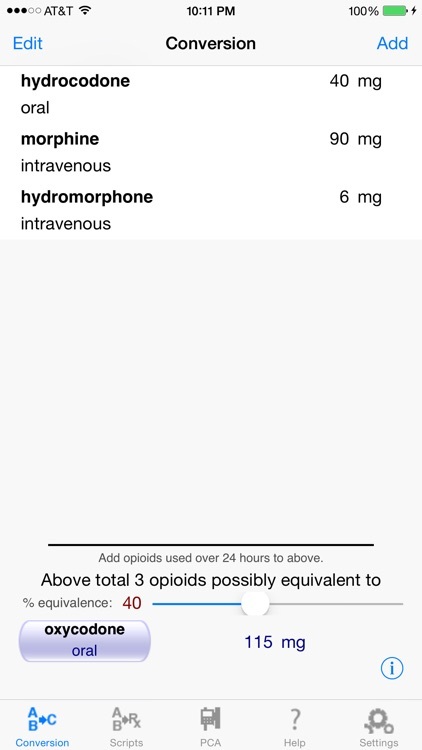 It can then display the new opioid dose in terms of a potentially more useful output, such as “morphine ER 30 mg tablet, 1 orally q 8 hours”, rather than just stating “morphine 90 mg”. An almost unlimited number of separate opioids that a patient may be using can be entered for consideration. If a patient is simultaneously using many different opioids such as morphine, oxycodone, hydromorphone, etc, these can all be entered. 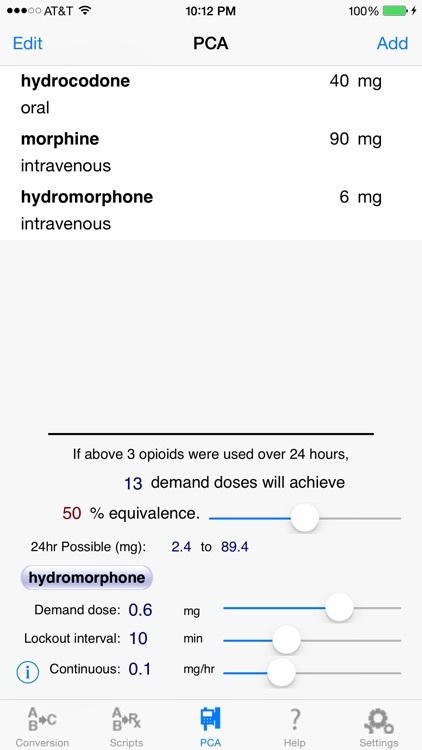 eOpioid™ has additional functionality to assist clinicians choose appropriate settings for Patient-Controlled Analgesia devices for IV opioids, such as for morphine, hydromorphone, and fentanyl for patients who may be opioid-tolerant. eOpioid™ has an extensive database of both long-acting and short-acting opioids. 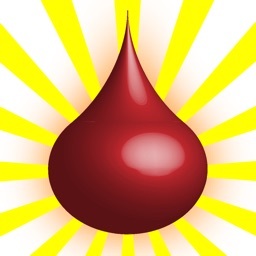 It can assist you in determining the doses for a regimen consisting of a long-acting opioid to be given around-the-clock with a short-acting opioid to be given on an as-needed basis (i.e. “PRN”). Even with the multitude of different features offered with eOpioid™, its interface is refreshingly clean and logical. It was designed to be intuitive and is a true example of form following function. 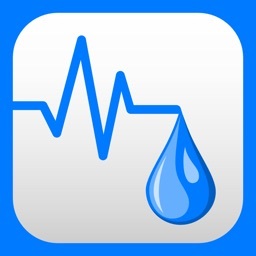 Please note that this software is not capable of performing medical consultations. eOpioid™ is an informational tool only and should only be used by specialized healthcare professionals. 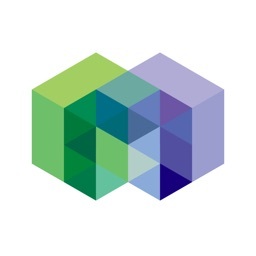 You are required to read the extensive help documentation within eOpioid™ to ensure a thorough understanding of the Software's capabilities and limitations. © SentientWare, LLC, 2009. All Rights Reserved. Protected by copyright and licenses restricting use, copying, distribution and decompilation. 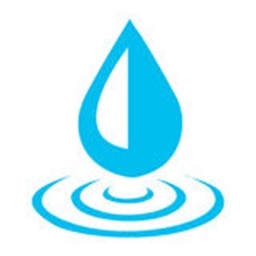 eOpioid™ and SentientWare™ are trademarks of SentientWare, LLC in the United States and other countries.